Not every home improvement project will add resale value to your home. While it may be what you want, it could make your home difficult to sell down the road, leaving you with little to no return on investment. If you are planning to remodel your home, you may want to take into account the ROI of your renovation and whether the upgrade will appeal to potential homebuyers or earn back funds through energy savings. 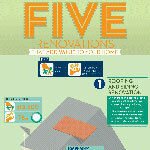 Discover popular home improvement projects that will add value to your home and help you get the most out of your money with this infographic from Citizens Bank.